Datura metel is a shrub-like annual (zone 5-7) or perennial (zone 8-10) herb, commonly known as devil’s trumpet and metel. Datura metel grows in the wild in all the warmer parts of the world, such as India and is cultivated worldwide for its chemical and ornamental properties. This plant was first described by Carl Linnaeus in 1753, but no botanically correct illustrations or descriptions were made until after the New World was settled. The original home of the plant remains uncertain as a result. The plant is an annual or perennial herb growing up to 3 ft (0.91 m) high. It is slightly furry, with dark violet shoots and oval to broad oval leaves that are often dark violet as well. The pleasantly-scented 6–8 in (15–20 cm) flowers are immensely varied, and can be single or double. Colors range from white to cream, yellow, red, and violet. The seed capsule is covered with numerous conical humps and a few spines. It is similar to D. innoxia, but D. metel has almost glabrous leaves and fruits that are knobby, not spiny. D. innoxia is pilose all over and has a spiny fruit. 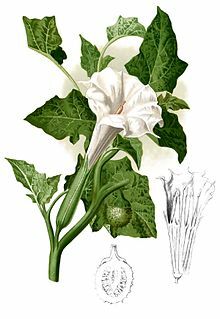 All parts of Datura plants contain dangerous levels of highly poisonous tropane alkaloids and may be fatal if ingested by humans or other animals, including livestock and pets. In some places, it is prohibited to buy, sell, or cultivate Datura plants. Datura metel is one of the 50 fundamental herbs used in traditional Chinese medicine, where it is called yáng jīn huā (洋金花). However, the ingestion of D. metel in any form is dangerous and should be treated with extreme caution. According to Drug & Cosmetic Act 1940 & Rule 1995, Datura metel is banned in India for use in Ayurvedic medicine. Leaf – Simple, alternate, petiolate, entire or deeply lobed, glabrous showing unicostate reticulate venation and exstipulate. Calyx – Sepals 5, green, gamosepalous showing valvate aestivation. Calyx is mostly persistent and odd sepal is posterior in position. Corolla – Petals 5, greenish white, gamopetalous, plicate showing twisted aestivation, funnel shaped with wide mouth and 10-lobed. Androecium – Stamens 5, free from one another, epipetalous, alternate the petals and are inserted inside the middle of the corolla tube. Anthers are basifixed, dithecous with long filament, introrse and longitudinally dehiscent. Gynoecium – Ovary superior, syncarpous and bicarpellary. Ovary is basically bilocular but tetralocular due to false septa. Carpels are obliquely place and ovules on swollen axile placenta. Style simple, long and filliform. Stigma is two lobed. Fruit – Spinescent capsule opening by four apical valves with persistent calyx. ^ “Datura metel L. (Solanaceae)”. Globinmed. Global Information Hub On Integrated Medicine. Retrieved 28 March 2017. ^ Safford, William E. (19 April 1921). “Synopsis of the genus Datura”. Journal of the Washington Academy of Sciences. 11 (8): 173–189. JSTOR 24532461. ^ a b c Preissel, Ulrike; Preissel, Hans-Georg (2002). Brugmansia and Datura: Angel’s Trumpets and Thorn Apples. Buffalo, New York: Firefly Books. pp. 120–123. ISBN 978-1-55209-598-0. ^ Michelson (2008). “Datura ingestion: a review of literature and case reports”. Journal of Pharmacology and Toxicological Studies. 25 (7): 198–209.